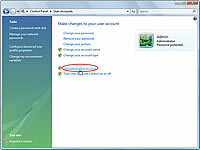 The Windows Vista Guest account allows anyone to use your laptop. Even considering that the Guest account is highly limited, that’s just enough for a data thief to get a foothold and start hacking away. 1Choose Start→Control Panel, and open the Control Panel's User Account Control Panel icon. You’ll be faced with a slew of User Accounts options. Click the Continue button if you’re visually assaulted by a User Account Control warning. If the screen says Guest account is off, then everything is fine and you’re done. 3Click the Guest Account image to select it. 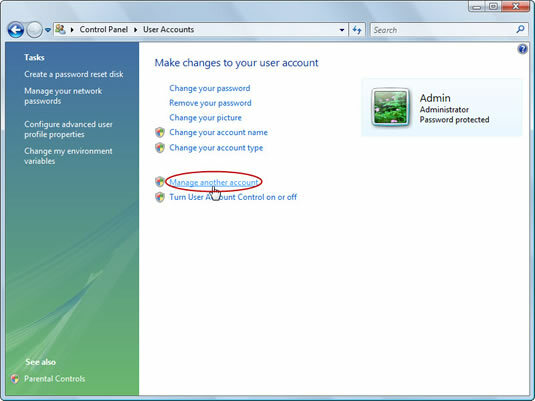 This is where you can set the limitations of the Guest account, including deactivating it. 4Choose Turn Off the Guest Account. If you ever need to turn the Guest account back on, this is the place to do that as well. 5Close the User Account window. Your Windows Vista laptop is now that much safer.